If you think we’ve been eerily quiet, it’s only because we’ve been SOOOO busy. We just had a chance to post a new photo album showing all of the major projects we are engaged in right now. Take a peek and see what’s coming down the pipe. We are also getting ready to launch Landau Wholesale Jewelry E-Commerce site, and the Delta Medix website that has been our baby for about a year now is wrapping up. 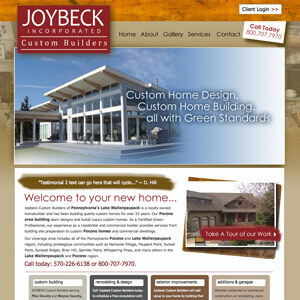 Check out the great new website for Joybeck Custom Builders. They approached us after our work with Davis R. Chant Realtors. Pete Helms, founder of Joybeck Custom Builders, and one of Chant’s principals, asked us to create a website that would allow visitors to see and feel Joybeck’s quality. Knowing how many people use the web now for learning more about a company before ever calling them, we created a site that features photo galleries of their major projects, including the Hawley, PA Visitor’s Center. We also included a client-only area where Joybeck’s clients can view their building project’s status and photos. We made the client interface simple for Joybeck to edit on the go using their iPad.